Gemini (the Twins) and Auriga (the Charioteer) are well-placed for viewing in the western sky this month. Both contain more faint stars than bright, but their upright orientations should help you connect the dots and trace their otherwise elusive shapes. 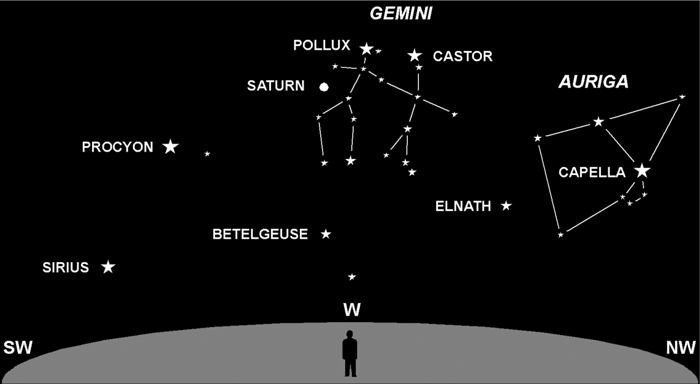 Like all constellations, Gemini was named millennia ago, before electric yard lights, billboards, smog and the other trappings of modern civilization. The fainter stars that complete the constellations can no longer be seen by most city-dwellers. Perhaps the Twins cross the sky hand-in-hand so not to lose sight of each other. The Twins’ heads are the nearly identical and relatively bright stars Castor and Pollux (the latter slightly brighter and closer). Brighter still is planet Saturn, now south of Gemini. The head of the Charioteer is all there is to Auriga. He has a jutting chin and blunt nose, and wears his pointed helmet low. Capella, the fifth brightest star in our sky, is his glaring eye. He’s supposed to look like a “tough guy,” but was neither chariot driver nor warrior — Auriga, the son of Vulcan and Minerva, was the inventor of the chariot. Every so often, the real heroes triumph. Previous Previous post: Q&A: No Telescope? No Problem.